Biryani is a traditional Indian, oven-cooked dish blending rice with authentic spices, and meat or vegetables - it is hugely popular in Indian restaurants. This delicious version with minced lamb, almonds and raisins couldnâ€™t be easier to make. Boil the rice with salt in plenty of water till cooked. Drain the excess water and keep aside. Heat the ghee / oil in a wok , add the onions and sauté until golden brown. Add the lamb, red chilli powder, coriander powder; garlic and ginger pastes, yoghurt, and salt, Cook until the lamb is well browned, adding 2 tbsp of water as and when required to avoid it sticking to the bottom of the pan. When the lamb is tender and no liquid remains add the garam masala; mix well. In a greased, heavy-bottomed pan (not too large), spread a layer of rice evenly and sprinkle half the milk over it. 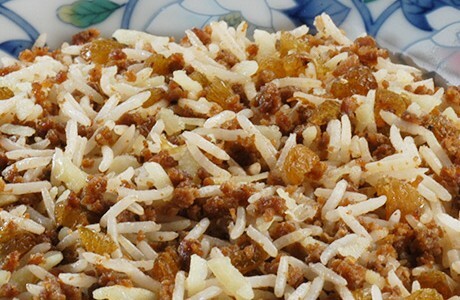 Spread half of the lamb mixture evenly over the rice, Then cover with another layer of rice. Spread the almonds-raisins, wholemilk fudge, lemon juice mixture over this, and then spread the remaining lamb mixture. Cover with rice once again. Sprinkle with the rest of the milk. Cover the dish with an aluminium foil and a lid thereafter Put the pan on very low heat and cook on low heat for half an hour.